Veldt's mission is to make design conscious and functional wearables, which sounds like what every other smartwatch company is trying to do right now. The Luxture (that's luxury and future squashed together) is definitely not your average smartwatch that's for sure. It's a quartz movement watch with a slim 38mm watch body and measures in at just 11mm thick. So it's a good fit for slimmer wrists and for women. The decision to go smaller was apparently based on customer feedback and the demand for more smartwatches for women according to Veldt CEO Jin Nonogami. 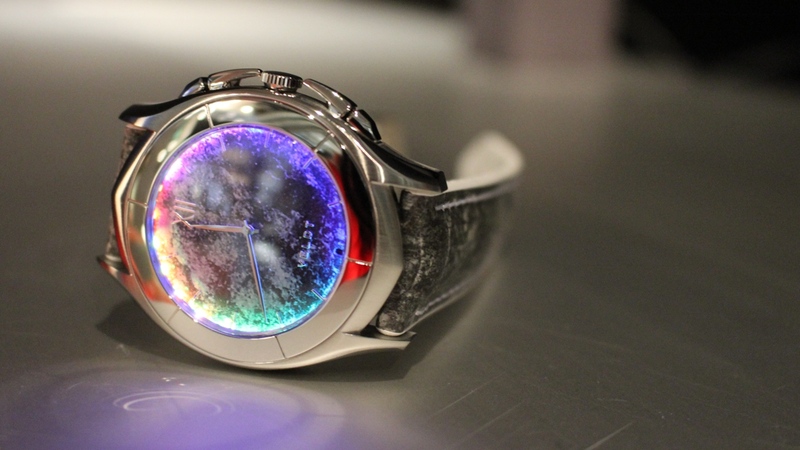 We took a look at the watch at Baselworld. There's a slick stainless steel body and sapphire glass to tick those luxury watch boxes, but where things get a little bit different is with the 24 LED lights that sit underneath the bezel. When synced with your iPhone or Android phone, a series of different coloured light patterns illuminate the outer edges of the watch face to act as different alerts and notifications. So for weather updates it'll light up yellow for sunny or blue for rain. There's similar features for incoming mail, calls, schedules and even activity level. It sounds a bit gimmicky, but there's an interesting concept here and a nice alternative to sending a buzz or flashing up text on a screen. It's not done with light here either as it also tracks ambient light to keep monitor the time you've spent out in natural light and there's a UV sensor to keep you safe in the sun. We get back to normality on the activity and sleep tracking front where Veldt has worked with the National Center of Neurology and Psychiatry to develop what it says is a highly accurate sleep analysing algorithm. Along with the ambient light tracking data, this information is then presented in graphs inside of the app in the hope of improving your 'Life Rhythm'. The idea of lights illuminating throughout the days sounds like it would be a be a pretty big drain on battery, but Nonogami told us that it will be able to go for at least 1 week in standby mode and will offer wireless charging. Veldt to launch the Luxutre in December 2017 with entry models starting at $500 going up to $2,000. At the moment though, it's still in concept stage, and looks like there's still some work to be done to get polished and wrist-ready. The strap definitely doesn't look too pretty right now. What's more interesting here is that Veldt wants to license the circuit module and software that gives the Luxutre its unique features. So maybe we'll see the light tech turn up inside another smartwatch in the not too distant future.